To work in NASA’s Mission Control Center and share in the excitement of seeing the very first close-up images of Saturn being piped back to Earth (from the Pioneer 11 spacecraft in 1979) is not a sensation that most high school students get to experience. However, as part of an internship in NASA’s Space Biology Program , Mary M. Yang had the opportunity to do just that. 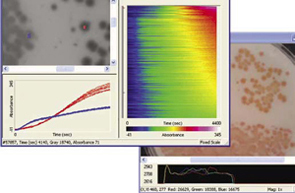 KAIROS Scientific, Inc.’s graphical user interface for digital imaging spectroscopy. Close to 60,000 individual kinetics data have been sorted, with single pixel reaction kinetics being shown here. This rewarding experience of working with NASA turned out to be the first of several for Yang, who, as a young student, was fascinated with planetary imaging and remote sensing observations. Following high school, she worked at the Jet Propulsion Laboratory , developing sensors for NASA, and attended the University of California, Berkeley. Yang then went on to pursue a doctorate in geology at Princeton University, where her thesis covered spectroscopy and data analysis of minerals and solutions—themes she also encountered in her work for NASA. After completing her doctorate, Yang joined the research laboratory of Douglas Youvan, then a chemistry professor at the Massachusetts Institute of Technology. In order to bypass weeks of sample preparation time, Youvan and Yang developed prototype imaging spectrophotometers that enabled them to acquire spectra directly from bacterial colonies growing on the surface of a Petri plate. This type of imaging instrument analyzes a combination of spatial and spectral information so that spectra can be obtained for each feature in an image. Analyses of this kind were initially applied by NASA to rather large scenes, such as planetary and remote sensing studies. In remote sensing, for example, NASA utilizes aircraft- and satellite-based imaging spectrophotometers to collect airborne data. In 1991, Yang and Youvan founded KAIROS (now KAIROS Scientific, Inc.) to extend Yang’s NASA “know-how,” plus the imaging spectrophotometers initially developed for laboratory-based photosynthesis studies, to the fields of materials science, health, and biotechnology. Based in San Diego, KAIROS Scientific develops molecular biology methods, instrumentation, and computer algorithms to create solutions to challenging problems in the medical and chemical industries. The company’s pioneering efforts in digital imaging spectroscopy (DIS) enable researchers to obtain spectral and/or time-dependent information for each pixel or group of pixels in a two-dimensional scene. In addition to having Yang’s NASA experience at its foundation, KAIROS Scientific was established with the support of many government grants and contracts. Its first was a NASA Small Business Innovation Research (SBIR) grant, from Ames Research Center , to develop HIRIM, a high-resolution imaging microscope embodying both novel hardware and software that can be used to simultaneously acquire hundreds of individual absorbance spectra from microscopic features. Using HIRIM’s graphical user interface, MicroDIS, scientists and engineers are presented with a revolutionary new tool which enables them to point to a feature in an image and recall its associated spectrum in real time. The HIRIM instrument was delivered to the Earth Science Division at Ames in May of 1998. This delivery marked the end of the 3-year SBIR research and development program, which included acquisition of spatial and spectral information of hundreds of algae and cyanobacteria immobilized on slides. NASA wanted to collect this information as a ground-truthing means (the use of a ground survey to confirm the findings of an aerial survey or to calibrate quantitative aerial observations) for satellite and remote sensing studies of oceanic phytoplankton, and to provide insight into the contributions of these organisms to primary production and global carbon cycles. Since this original application, HIRIM has also been used by NASA scientists to study meteorite specimens called meteorite thin sections. By mounting a very thin slice of a meteorite specimen (about 30 microns thick) on a glass slide, the scientists can determine its make-up and learn what environmental conditions the specimen has been exposed to. KAIROS Scientific, Inc.’s Kcat Technology consists of methods, instrumentation, and algorithms for solid-phase enzyme screening. 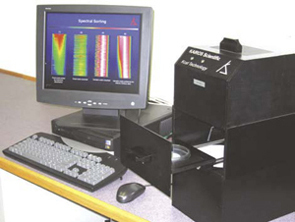 The Kcat instrument seen here is connected to a desktop workstation and displaying a panel of results from the sorting of approximately 12,000 individual absorbance spectra. Kcat Technology has been commercialized in the form of products and services for chemical companies, pharmaceutical firms, and academic laboratories. KAIROS Scientific has licensed and applied its DIS technology platform to several application areas. In the area of disease management, DIS is demonstrating that it may be possible, in certain situations, to differentiate healthy and diseased tissue, based on their spectral properties. By using DIS to combine spectral and image analyses, it may also be possible to detect subtle spatial features in human tissue for applications in pathology and oncology. KAIROS Scientific is most known, though, for commercializing a DIS-based solid-phase enzyme screening technology, called Kcat Technology. With the combination of Kcat Technology and years of experience in protein engineering, the company is significantly accelerating the pace of custom enzyme development and commercialization. In order to develop new enzymes at a faster pace, the population of enzyme variants must be carefully designed and an efficient high-throughput screening method must be used. Kcat Technology consists of methods, instrumentation, and algorithms that enable rapid and efficient screening of enzyme variants expressed in microcolonies. It utilizes a solid-phase format and incorporates a small assay disk on which thousands of individual variants can be simultaneously screened. This is a thousandfold reduction in volume as compared to traditional liquid-phase screening. Only tens of nanoliters per reaction are needed, making the Kcat Technology particularly useful for performing assays that require expensive or difficult-to-synthesize reagents. The multispectral capability of Kcat Technology is especially useful for multiplexed reactions (for evolving new substrate specificity or enantioselectivity). The solid-phase format allows assay design flexibility so that multiple properties can be evolved and screened for in the same variant. It is also particularly effective on insoluble or high-molecular weight substrates (proteins or polymers), since it requires almost no pipetting. A throughput of up to a million variants per instrument per day can be achieved on a bench-top instrument without the need for complex robotics. Kcat Technology has been commercialized in the form of products and services which KAIROS Scientific provides. Clients include multinational specialty chemical companies, large pharmaceutical firms, and academic laboratories. KAIROS Scientific was recently awarded its sixth Federal Phase II SBIR grant, to develop cellulase enzymes for biomass conversion. Engineered cellulases may be applied to papermaking, paper recycling, and the efficient conversion of agricultural waste into ethanol for fuel. HIRIMTM, MicroDIS™, and Kcat Technology™ are trademarks of KAIROS Scientific, Inc.